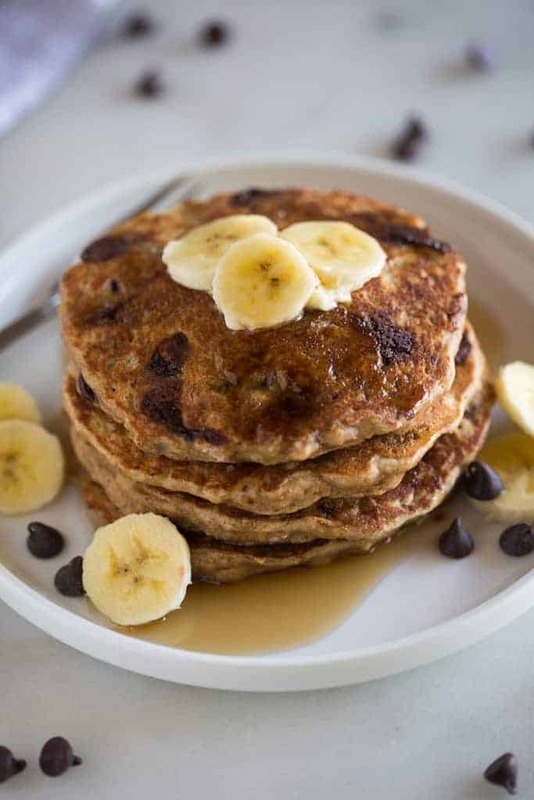 Whole Wheat Chocolate Chip Banana Bread Pancakes made with Greek yogurt, buttermilk, mashed banana and whole grains for extra fluffy and flavorful pancakes. 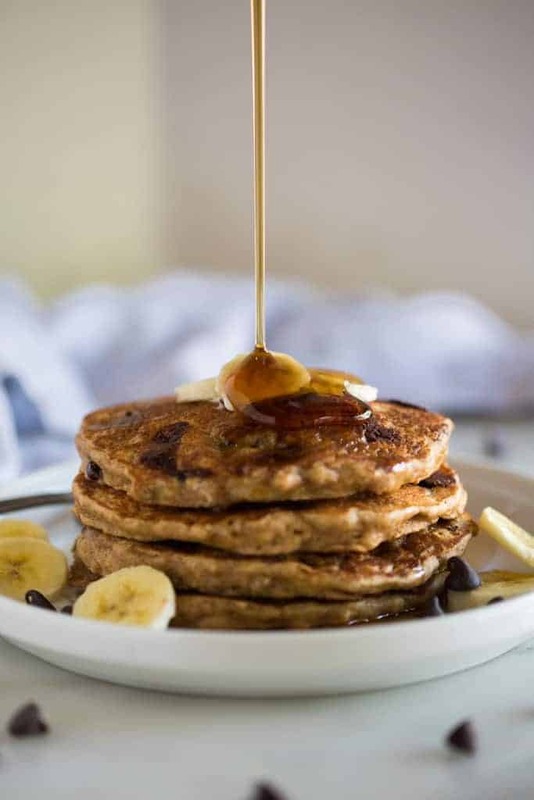 One of my favorite healthy (er) pancake recipes! There is nothing my kids love more for breakfast than pancakes! We usually make them on the weekends, and they are a nice change-up from yogurt or eggs, which I make during the week. It’s choosing the type of pancakes, that’s the problem! We too many favorites, like traditional buttermilk pancakes, 5-minute whole wheat pancakes, and german pancakes. 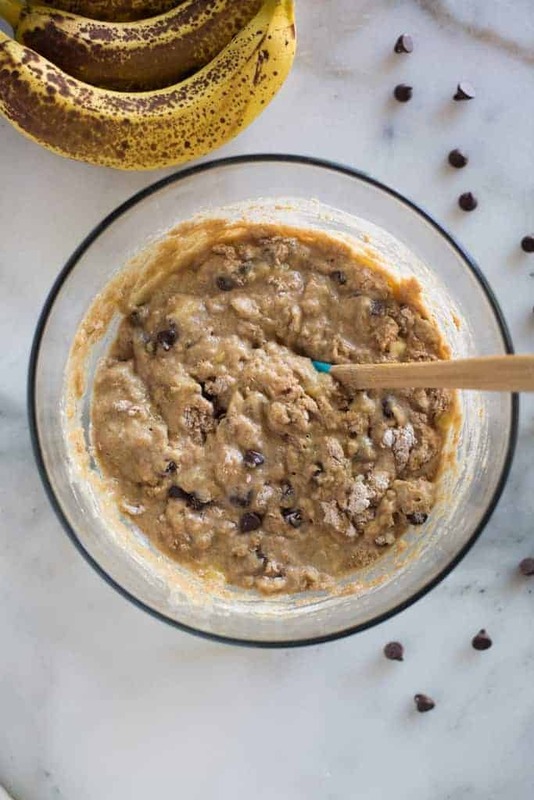 If I happen to have overripe bananas on the counter, the unanimous vote is always these Whole Wheat Chocolate Chip Banana Bread Pancakes! They are delicious, really flavorful and filling. Start by adding all of the “wet” ingredients and the sugar to a mixing bowl: mashed bananas, buttermilk, eggs, Greek yogurt, vanilla, and melted butter. Mix the dry ingredients in a separate bowl: whole wheat flour, baking soda, baking powder, cinnamon and salt. Gently stir the dry ingredients and chocolate chip into the wet, being careful not to over-mix the batter. The batter will be thick. Spoon about 1/4 cup full onto a hot skillet and spread it into a circle. Cook until golden on the bottom and small bubbles come to the surface. Flip to the other side and cook for another minute or two. Serve with syrup and fresh sliced banana. Resist the urge to mix the pancake batter until it’s completely smooth. When you combine the wet and dry ingredients together just mix it to incorporate everything. It’s okay if it’s slightly lumpy with streaks of flour. If you mix pancake batter too much it causes the gluten to develop in the flour and your pancakes will be chewy and instead of fluffy. DO NOT PAT DOWN PANCAKES. Once you pour the pancake batter onto the hot skillet, don’t pat down on the pancakes while they cook or you will break the air pockets that help make the pancakes light and fluffy. DO NOT FLIP THE PANCAKES MORE THAN ONCE. Wait until you see small bubbles rise to the surface of the pancakes, and then they’re ready to flip. Just flip each pancake one time, and cook it on the other side until it’s done. It wont take long. 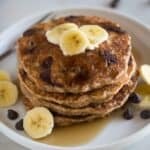 Whole Wheat Chocolate Chip Banana Bread Pancakes made with Greek yogurt, buttermilk, mashed banana and whole grains for extra fluffy and flavorful pancakes. Add banana, buttermilk, Greek yogurt, sugars, egg, vanilla and melted butter to a bowl and mix well. In a separate bowl stir the dry ingredients together. Add the dry ingredients to the wet ingredients and mix, just until combined. Fold in chocolate chips, being careful not to over-mix the batter. It's okay if it's lumpy, and the batter will be thick. Heat a griddle to 350 degrees F. (Or use a skillet over medium heat). Grease the griddle or skillet, if necessary. Scoop 1/4 cup of batter onto the skillet and spread into a circle. Cook until the bottom is golden grown, then flip and cook on the other side. Serve warm, with syrup, sliced bananas, and chocolate chips, if desired. I originally shared this post in August 2015. Updated March 2018. Made these for dinner tonight. A big hit with everyone. Looks delicious, would it work if I use regular flour?